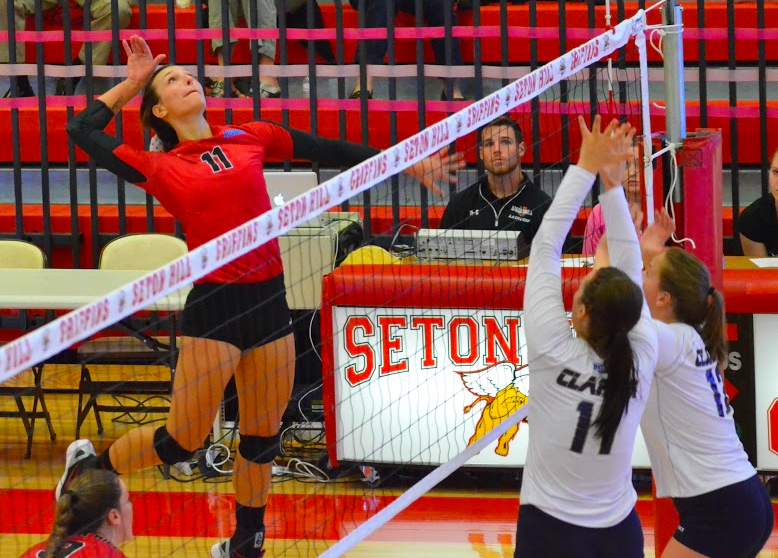 The women’s volleyball team at Seton Hill University has one end goal in mind, to win the Pennsylvania State Athletic Conference (PSAC). The PSAC is the largest intercollegiate NCAA conference in the state. So far, the team has won seven out of the nine PSAC games played. “If we get a bid to regionals, that would be a tremendous accomplishment,” said Richard Hall, head coach for the Lady Griffins. Currently holding the second place spot in the PSAC West with a record of 16-5, the Lady Griffins are also undefeated at home so far this season and on a three game winning streak. With a majority of younger players this year, Hall said, “the team has a lot of work to do to get where they were last year. 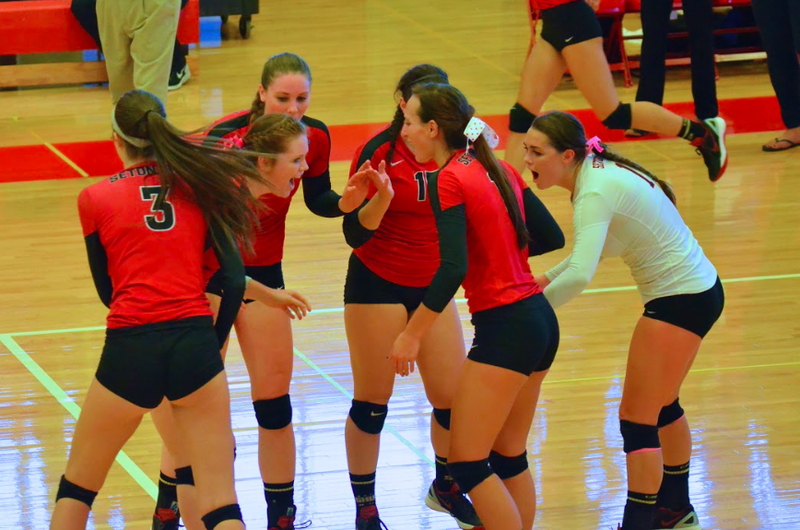 This year’s opponents are stronger and offer a tougher competition.” Last year the Lady Griffins finished with a 32-6 record when their season fell short after losing to Wheeling Jesuit University 3 sets to 0. “I’ve already seen improvements since preseason, but in order to be where we were last year, we need to be more consistent,” said Cassie Hausfeld, junior outside hitter and captain of the team. Right now the players are focusing on one match at a time. 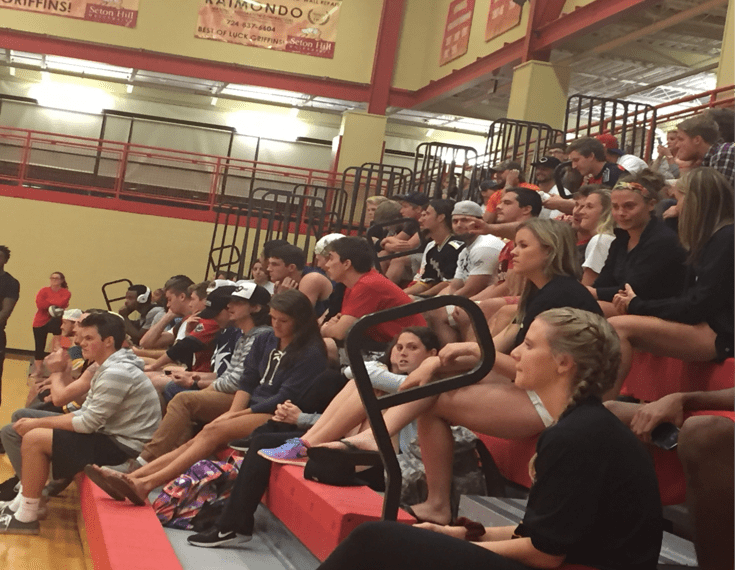 They spend many hours each week training and practicing for every match.“It’s hard to say just how much time you dedicate to volleyball, since there is the time that you’re actually playing, the time that you’re talking about playing and the time that you’re thinking about playing,” said Emily Gilles, outside and right side hitter. “Honestly, I think if it were allowed, we would practice non-stop because we all love it so much,” shared Giles. The coaches aren’t the only ones pushing the team to be its best. “We have such a small team, so we are all very close and it’s fun to push each other to become better athletes,” Gilles said. Aside from team accomplishments, each player has personal goals as well. “I’d definitely like to win a PSAC award,” said Hausfeld. She has already won player of the week, and continues to prove she is a worthy player by leading the Griffins with 236 kills and second in most digs behind senior defensive specialist, Lauren Teed. “She has played extremely consistent games and is someone the team can depend on in an extremely tough situation,” Hall said. Overall, Hausfeld said she wants to be a good leader for the younger players on her team. “Although we’ve started our season with a few losses, I think that this is really a building time for us,” Gilles added. “We’d love to have everybody. It’s a fun atmosphere to come watch the kids and watch them play,” Hall said. “There is so much heart on this team and we owe everything to our amazing support that we receive from fans, friends and family,” Gilles said. “Griffin pride is real!” The Griffins Volleyball team will look to continue their success in the PSAC East-West Crossover Tournament on Oct. 16-17.